Danielle Fenical was surprised when the court summons arrived. A collection company called SB&C was suing her for a $249 medical bill from two years earlier that her insurance hadn’t paid. Fenical said the company had tried to reach her once before, months earlier. But when she returned its call, the woman who answered could find no record of her. Fenical said she left her cellphone number anyway, but never heard back. Now, after reviewing the summons and realizing the debt was legitimate, the single mother mailed the company a batch of postdated checks. The company told the judge the checks had come too late, and the judge ruled in its favor, tacking on $500 in attorneys fees. The judgment allowed SB&C to garnish wages from her nursing home job, adding more fees and interest along the way. Over the next nine months, the company collected some $1,260 from her paychecks, more than four times her original bill. Fenical’s case isn’t unusual in a state that has a punishing suite of debt laws unlike anywhere else in the country. Companies that win judgments can collect attorneys fees and interest at 12 percent — the highest flat rate in the country. The firms can then garnish the debtor’s wages while piling on additional fees every 60 days. Taken together, even small debts can swell into large ones, an enticement industry insiders say can make it more attractive for these firms to seek court judgments rather than work out payment plans with people in financial distress. It is such a lucrative option that some of the state’s busiest collection firms have placed quotas on their agents to initiate lawsuits, according to interviews with current and former employees at those companies. The companies operate in such mass quantities, The Seattle Times found, that some individual collection attorneys have been handling more than 5,000 new cases each year, potentially racking up hundreds of thousands of dollars in lawyers’ fees for cases that are often processed in minutes and rarely go to trial. The courts have made it easy. Some allow collection companies to initiate a lawsuit without first filing it in court. Collectors have used that strategy in thousands of cases in recent years, allowing them to win a judgment against the consumer on the same day the case eventually gets filed. In others, lawyers for the companies can win a judgment without ever stepping foot in court. While some states have worked to ease laws to help consumers break the cycle of debt, Washington’s laws for consumers have remained largely unchanged. The 12 percent interest rate on judgments, for example, was last altered when double-digit interest rates were the norm. The collection industry, meanwhile, has built a powerful lobbying apparatus to combat some proposals that would ease the burden on consumers. Jason Woehler, a prominent collection industry attorney, said his companies seek to work with consumers on their debts and that lawsuits are a last resort. But he said that tool is needed to force some people to re-prioritize their lives to pay off what is owed. Without that option, Woehler said, some people would just go on ignoring their obligations. “A lot of times we know a certain percentage of people simply are not going to pay voluntarily,” Woehler said. Even without a lawsuit, the process of being in debt already puts a squeeze on consumers by tarnishing their credit. But judgments can last for 10 years, then be renewed for another 10 if they remain unpaid, so the collection process and the interest that comes with it can follow a consumer for much of their life. On typical Monday mornings, debt collection agents at Merchants Credit Association gather in a conference room at the company’s Redmond headquarters, settling into rows of chairs facing a massive screen listing the company’s latest stats. Damian Gomez, a former collector, recalled how the collection manager would spend the meeting going over numbers and totals, calling out the collectors having the most success and those falling behind. One of the metrics up for discussion: how many lawsuits each of the collectors had initiated. Three former workers at Merchants Credit said in separate interviews that company leaders had established quotas for them of about 500 lawsuits or wage garnishments per year that they were expected to pursue. Gomez, who worked at Merchants Credit for five years until 2015, said debt-collection phone calls with consumers may have come across as friendly but were always structured with the likelihood of an eventual lawsuit in mind. He would first confirm the consumer’s address — information needed to serve them with a lawsuit later. He would ask about their current employment — information needed to garnish their wages later. With enough information, Gomez said he would end a call by telling the consumer they have 30 days to make payment arrangements. “You are not calling them in any way shape or form to help them out,” Gomez said, who said he feels liberated after leaving the collection industry. He said collectors had the option of establishing payment plans with consumers but also had to balance that with the internal pressures to keep lawsuits coming. And he said the company was thrilled with lawsuits because the process helped build debts into larger ones. “It’s really turning lemons into lemonade,” said Ken Lewis, another former Merchants worker. Woehler, the attorney for Merchants who has been with the company since 2014, disputed that the company had “quotas” for collectors. He said the numbers recalled by former workers may have just been performance goals based on internal averages, but he said actual lawsuit numbers vary widely depending on the types of cases assigned to a collector. A current worker at Valley Empire Collections in Spokane Valley said some collectors will tell customers to call back by a certain date but not disclose that a lawsuit will be filed if the consumer doesn’t make contact by the deadline. The worker, who requested anonymity to avoid being disciplined by Valley Empire, said not disclosing that information downplays the importance of the deadline and allows the collectors a better chance of bumping up their lawsuit numbers. The emphasis on lawsuits was one of the reasons former collector Scott Mullerleile said he left Valley Empire in 2013. “They would just sue, sue, sue and sue people,” said Mullerleile, who recalled an expectation that workers would move 20 or more lawsuits per month. At SB&C, the company that rejected Fenical’s postdated checks, one former worker recalled some discussion of quotas while two others said the company would simply talk to collectors about the need to pursue lawsuits. “They would go around the office and say ‘this is how many legals we have, let’s try to bring it up,’” said one of the former workers, Scott James, who left the company last year. James said he would at times propose offering payment plans to some consumers but that managers often rejected the plans, even if he pleaded that it would financially ruin the consumer. SB&C owner Garth Brandt said his company makes every effort to find reasonable ways for consumers to pay off the debt and often allows payments below what would be allowed during a garnishment. He said the company makes considerable effort to resolve bills before permitting staff to initiate legal action. Valley Empire’s owner did not return messages seeking comment. With the ability to add fees and interest along the way, The Times found, some companies have filed lawsuits for debts less than $100 and as low as $31, in a King County case over an unpaid dental bill. Woehler, the general counsel for Merchants who has handled thousands of their cases, said in an interview that his company won’t file a lawsuit unless the debt is at least $500. When a reporter later pointed out that he had recently filed cases for less than that amount, Woehler said he was mistaken and that the limit was $300. When a reporter pointed out lawsuits for even smaller debts, including one for under $100, he said there are exceptions to the guidelines. Woehler said the company always wants to work out payment arrangements without going to court but may also require consumers to provide proof of why they can’t pay it in full right away. He also said the company works for some high-volume clients, such as Virginia Mason hospital in Seattle, who may see a lack of litigation as a sign the company isn’t being proactive about collecting on the debts. Virginia Mason said in a statement that it strives to be fair, reasonable and respectful in the collection of debts, providing a range of financial assistance for patients who may have difficulty paying. Eight consumers described in interviews how collection agencies in the state rebuffed attempts to make payments on the debt, or suddenly took cases to court with little or no communication, adding new costs to the bill. King County District Court Judge Elizabeth Stephenson said she has at times been baffled by the collection cases that arrive in court. In the past, she said, judges would sometimes encourage collection attorneys and consumers to go out in the hall to try and come to a resolution. Stephenson said that stopped after the creditors’ attorneys complained that it may cause them legal problems because those conversations may be considered collection work, not legal work. In Fenical’s case, she recalled continuing efforts to set up payment arrangements after her court hearing but said that SB&C wouldn’t accept anything less than $290 per month — more than the original debt and impossible for her. Brandt, the SB&C owner, declined to discuss Fenical’s case specifically but said the company will still work with consumers after a judgment is issued. SB&C started garnishing about 25 percent of Fenical’s take-home pay from her job at a nursing home, adding more fees and interest along the way. Fenical said the cuts from her paycheck forced her to delay paying other medical bills and caused her to fall behind on credit card payments. Across the country, there are wide disparities in how much collectors can gain after their judgments. When collectors win a court decision against a consumer in New Jersey for less than $15,000, the remaining debt will then grow at 1.5 percent. In Texas, it’s 5.5 percent. Some states link their judgment rates to prevailing interest rates to keep up with ongoing changes in the market. 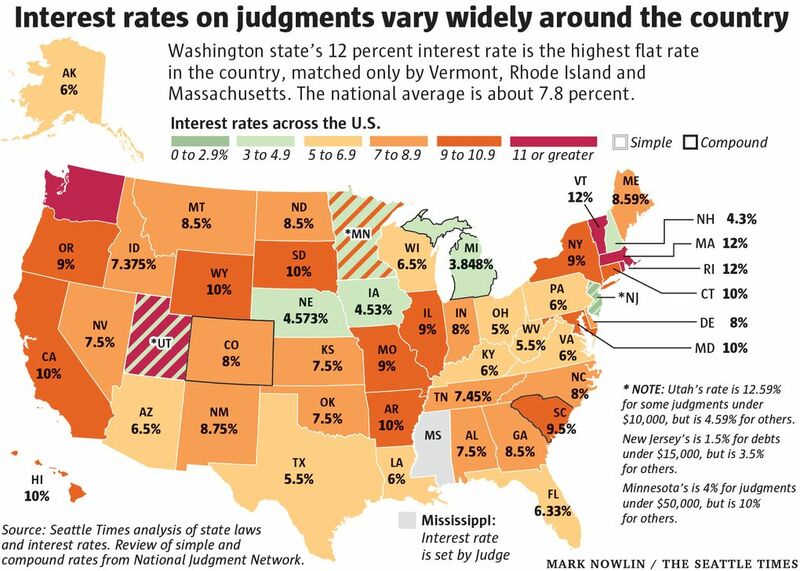 The 12 percent level is the highest flat rate in the country, currently shared by Washington, Massachusetts, Rhode Island and Vermont, according to a Times review of laws around the country. (Utah’s rate recently moved to 12.59 percent for some judgments under $10,000. It is 4.59 percent for others.) Washington’s law was last updated in 1985, when 30-year mortgage rates were at 13 percent. They are now at less than 5 percent. Alabama state Sen. Cam Ward, a Republican, looked at his state’s post-judgment interest rate several years ago and decided it was leaving consumers and others in perpetual cycles of debt. “I think that skews the purpose of the justice system,” said Ward in an interview. When he was pursuing the issue in 2011, Alabama had the same 12 percent interest rate as Washington state. Ward said he felt it was important for there to be some interest rate available because there are inflationary costs associated with lingering debts, but he said the 12 percent was just too exorbitant. He sponsored legislation to lower the state’s rate to 7.5 percent. Ward said there was some resistance to the bill from the collection industry but that the measure was largely embraced. Records show it passed the Alabama Senate by a 31-3 vote. Kentucky cut its rate from 12 percent to 6 percent in 2017. Washington state lawmakers have in the past couple of years looked at related issues. They removed a 12 percent interest rate for unpaid criminal court fines and costs. And after a dispute over whether collectors could calculate the 12 percent interest rate on medical debt starting from around the time the patient received the medical service, the industry sought to ensure retroactive interest is explicitly allowed. Amid that debate, the collection industry has organized into a political force here. The industry has for years raised and donated thousands of dollars to both Democrats and Republicans. Then, in 2016, the industry launched a new political action committee that quickly raised more than $100,000 from various collectors. Among them was Credit Service of Central Washington, a collection company owned by Sen. Judy Warnick, R-Moses Lake, that gave $5,000. The political action committee, named STRAT PAC, sent the bulk of the money to The Leadership Council, a committee for the Republicans in the state Senate, records show. “Your association became one of our top donors this cycle,” Schoesler wrote. Kelsi Hamilton, an industry lobbyist, later wrote a memo to others in the collection industry, explaining “just how important a role our PAC contributions play in our ability to meet and educate lawmakers on our issues,” according to documents. Rep. Laurie Jinkins, D-Tacoma, who chairs the House Judiciary Committee, said that lawmakers in the past hadn’t taken a close look at the overall 12 percent post-judgment interest rate or how it compares around the country. But this year, an early proposal in the Legislature backed by Jinkins and others such as Rep. Kristine Reeves, D-Federal Way, would have set the interest rate at 2 percentage points over the federal prime rate. That would have made it 7.5 percent this year. Reeves said the collection industry, led by Hamilton, balked at the idea. She recalled the industry bringing in the owners of some of the debt collection firms — “working families like other folks,” she said. In meetings, Reeves said, the business owners talked about the impacts the legislation could have on their business and their ability to keep people employed, such as working moms who work flexible hours. Lawmakers scaled back their plan and are now considering a flat 9 percent interest rate in a bill currently working its way through the Legislature. The national average is about 7.8 percent. Washington state’s collection process can be punishing in other ways. In the state’s Superior Court system, rules allow for cases to be served on consumers without the case being first filed in court. The process can baffle people who are in debt, since the documents don’t have any case number and there is no information at the courthouse about the filing. The collection industry typically uses experienced lawyers in court, while consumers rarely appear. And when they do, it’s often without legal representation. One person who had previously worked as a legal secretary, Heather Cooper, described the confusing process going to the courthouse to find that no case had been filed there. Another, Katrina Becker, said she wasn’t sure what to do with the documents. If consumers don’t formally respond to the company in 20 days, collectors can then file the case in court and win a judgment the same day. The state court data can be messy, dependent on the inputs from individual clerks. But in cases in which clerks labeled a ruling as a default judgment, The Times found more than 4,000 cases over the past decade in which a collection company got the ruling the same day the case was filed in court. They won many other judgments just a day or two after the initial filing. Becker said if she had been aware that there could be court consideration of the matter, she would have attended and explained to the judge her efforts and willingness to pay. “I would have showed up and I would have done anything I could,” Becker said. She also had another compelling argument: With a low income from her part-time job at Walmart, she said, the hospital and the debt collector had never informed her about charity care options that could have potentially wiped her debt clear. After a collector gets a judgment against a consumer, one common method of collection around the country is to seize wages from the consumer’s paycheck or from their bank account. A few states largely ban wage garnishments for consumer debts, while some states have taken steps to put strict limits on judgments, such as Massachusetts, which shields low-income consumers so that they can keep at least 50 times the state minimum wage — or $600 per week. While Washington state has one of the nation’s highest minimum wages, the garnishment law uses the federal minimum wage to calculate the minimum protection, shielding 35 times that standard — or $253.75 per week, leaving more money available for garnishment than in Massachusetts. Unlike in Washington state, Massachusetts also has a system that directs many debt collection cases into a “payment review” hearing. Raymond Dougan, a former judge in Boston, said that process allows a judge to assess the income and expenses of a debtor to determine an appropriate payment plan, perhaps for as little as $25 per month, or to determine that the person cannot pay. Dougan also said debt collectors in Massachusetts rarely seek to collect attorney fees in the cases because they don’t have the right to do so unless they produce documents showing that an underlying credit contract allows it. That’s a stark difference to Washington, where state law and court rules allow attorney fees to pile up. Debt-collection attorneys often handle their cases in bulk. In a deposition reviewed by the Times from a lawsuit in which a consumer said collectors had filed suit after the statute of limitations had expired, collection attorney Karen Hammer described how clients can provide data to her firm in electronic format. Paralegals in her firm, Bellevue-based Suttell and Hammer, then feed it into a computer system that can automatically populate case filings. Hammer described how she would only need a minute or two to review and sign off on a lawsuit. In King County, attorneys can file electronically, and if the debtor doesn’t respond, a judge can issue a ruling without the attorney ever setting foot in the courthouse. Attorneys have grown so efficient that they can file cases by the thousands. Woehler, the attorney from Merchants who also works with another collection company, Evergreen Financial, is the attorney on 6,200 lawsuits that were filed in 2017, according to a Times analysis of court data. Timothy Durkop, who worked with Valley Empire and other companies, exceeded 6,500 cases that year. Joseph O. Enbody, who works with Dynamic Collectors, is listed on 6,600. An attorney for AllianceOne, K.C. Hawthorne, topped 7,000 cases. That caseload doesn’t include the management of previous cases, including those going through the garnishment process, where attorneys can seek additional fees. When a collector begins garnishing wages from a consumer in Washington state, they are obligated to renew it every 60 days, and with it a new round of fees, unlike in some other states which have much longer or no renewal period. Woehler said he supports eliminating the renewal process. In the meantime, he’s seeking to collect attorney fees at each step. Woehler, who works as a salaried employee, declined to say how much revenue those fees bring to his clients each year. This ever rolling collection of fees and interests can leave consumers on a debt treadmill. 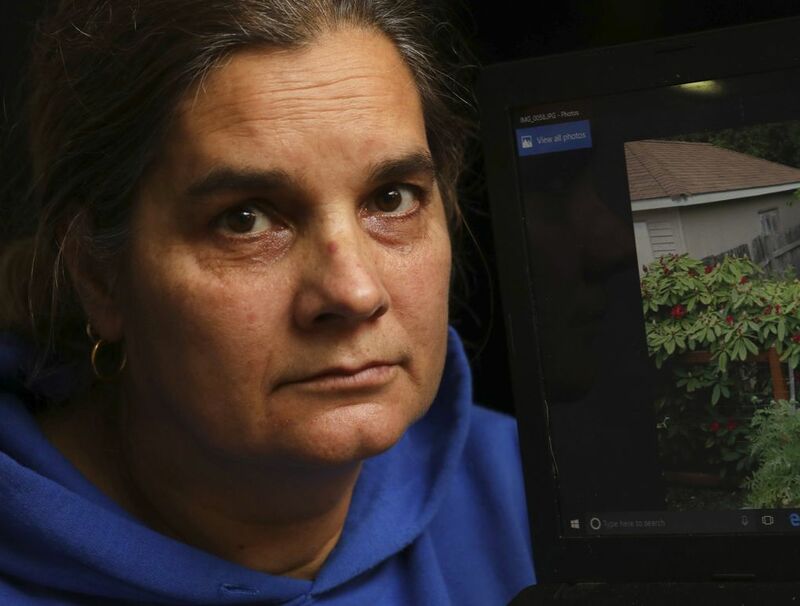 After losing her job and health insurance in 2013, Betsy Andrews tried to avoid a trip to the doctor until surges of pain in her stomach left her vomiting and writhing on the floor of her West Seattle home, wondering if death was imminent. Andrews was treated at Virginia Mason for kidney stones and an infection, returning home with a jarring final bill of $9,861. 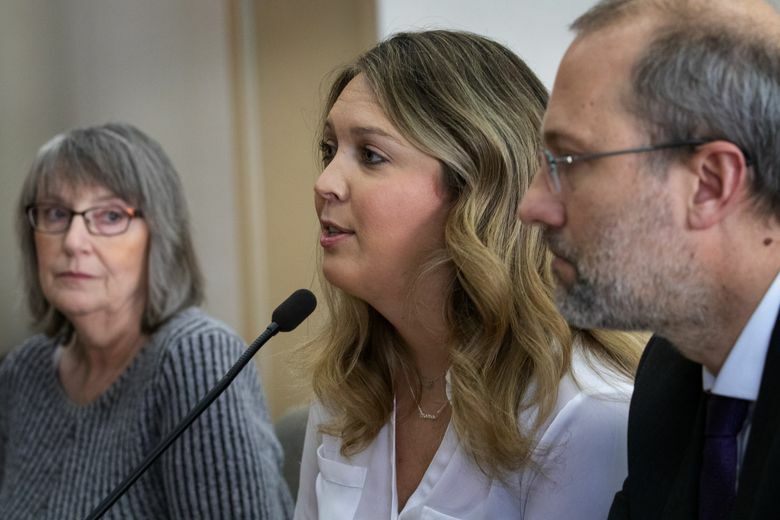 Merchants has since taken her to court and collected money from her paychecks at her new job as an instructional assistant at a Seattle middle school. The company’s attorneys have received court approval to add more than $2,000 to her debt from their fees alone. Andrews said it feels as if the process is doing little more than keeping a collection company in business while unduly punishing her and shaming her over the span of years. 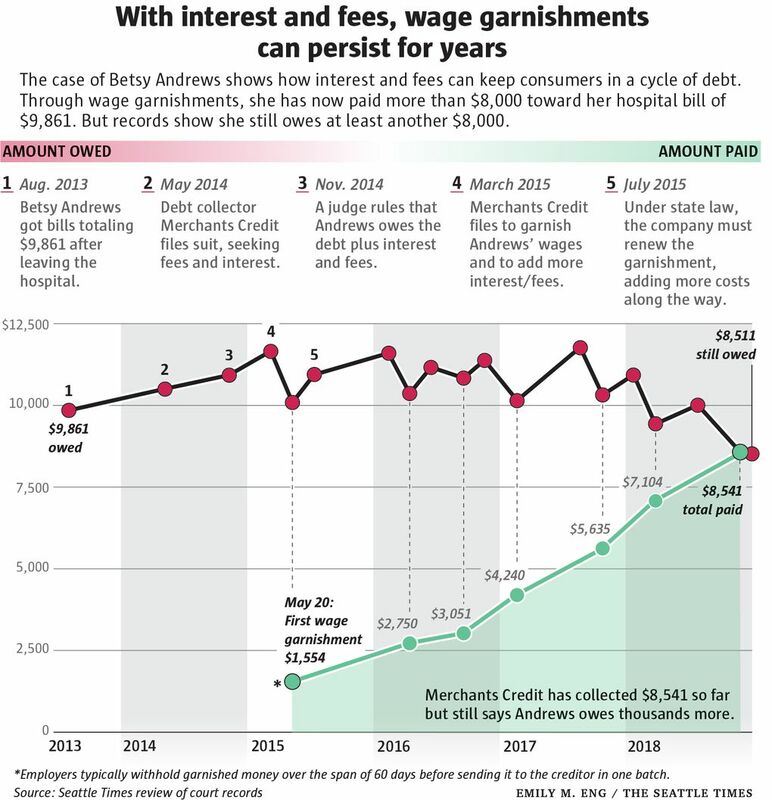 Five years after the lawsuit was filed, Merchants has collected $8,541 from Andrews’ paychecks. She still owes another $8,511.